Kennedy Space Center, Florida. 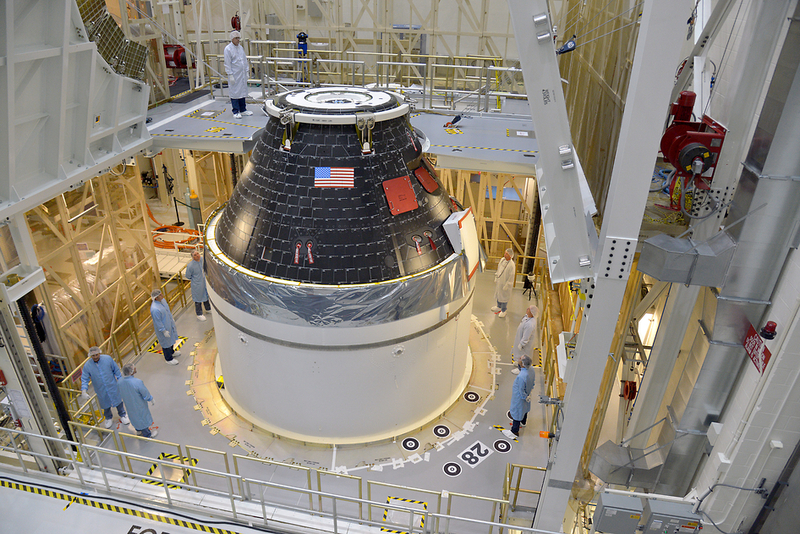 September 8, 2014 – Lockheed Martin and NASA engineers have completed the first Orion crew module. The module now sits atop its service module at the Neal Armstrong Operations and Checkout Facility at Kennedy Space Center in Florida. The crew and service module will be transferred together on Wednesday to the Payload Hazardous Servicing Facility, where the Orion spacecraft will be fueled with ammonia and hyper-propellants. In the coming months, Orion will be moved again for the installation of its launch abort system. At that point, the spacecraft will be complete and ready to stack on top of the United Launch Alliance (ULA) Delta IV Heavy rocket that will carry Orion into space on its first flight, Exploration Flight Test-1 (EFT-1), on December 4, 2014. During EFT-1, the uncrewed spacecraft will travel 3,600 miles beyond low Earth orbit. After two orbits, Orion will reenter Earth’s atmosphere at almost 20,000 miles per hour before its parachute system deploys to slow the spacecraft for a splashdown in the Pacific Ocean. The 4.5-hour mission will provide engineers with crucial data such as heat shield performance, separation events, avionics and software performance, attitude control and guidance, parachute deployment, and recovery operations. EFT-1 is one of two flight tests to validate the design of the spacecraft before it begins carrying humans. The Orion spacecraft will eventually carry astronauts farther into the solar system than ever before. The Lockheed Martin-built capsule will provide emergency abort capabilities, sustain the crew during space travel, and provide safe re-entry from space.